Let the Make Way for Ducklings 2018 Christmas Cards help you ring in the season. Completely personalizable, this Christmas Cards is sure to reflect the personal style of you and your family. 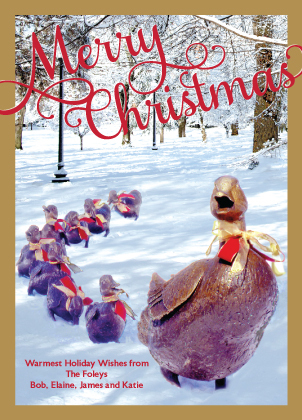 The Make Way for Ducklings 2018 Christmas Cards is a premium, one-of-a-kind Christmas Cards that is printed on the highest-quality card stock. Choose between classical felt or modern matte finishes to send the perfect message. LookLoveSend believes that when you order from us, you should not have to worry about anything, which is why we provide exactly matched white envelopes free of charge for the Make Way for Ducklings 2018 Christmas Cards. Order this Christmas Cards in quantities as small as 10, and you'll receive the ideal holiday treat.